DRF Bets is the online racing betting extension of DRF.com, which veteran handicappers will recognize as the biggest single source of horse racing news and past performances in the world. In other words, the same people who own and operate DRF also own and operate DRFBets.com. DRF Bets is brought to you buy the operators of the Daily Racing Form, which itself is known for its famous past perfomance cards. DRF Bets offers wagering on 300+ racetracks around the world and is home to a comprehensive rewards program that provides free PPs, store credit and cashback on wagers. So, if DRF Bets is basically just a skin for XpressBet, why not just sign up for an account at XpressBet? We will attempt to make sense of that question in our DRF Bets review, but the short answer is that it all comes down to rewards and benefits. XpressBet and DRF are both major players in the US horse racing industry and are equally safe. Ultimately, the decision to choose one or another comes down to personal preference. Speaking of which, you will need to choose one or the other. If you already have an account with XpressBet, you may only open an account at DRF Bets by calling DRF customer support and asking to transfer your XpressBet account over to DRF. It is not possible to maintain accounts at both websites simultaneously. Because DRF Bets is essentially a skin of XpressBet, it operates under the same licensing agreements that XpressBet has with tracks around the world. This is a good thing because it gives DRF Bets customers access to more than 300 racetracks around the world. This includes all the biggest racetracks in the United States, the ability to wager on all major racing festivals and direct access to track pools. Direct access to track pools is a big deal and a big benefit for customers. What this means is any wagers you place online are pooled with wagers taken in-person at the track. Doing so means you are paid at full track odds and also contribute to the health of local horse racing industries. As far as types of bets offered, DRFBets.com is able to offer every single type of bet that you would be able to place if you were at the track yourself. This includes the usual array of win, place and show bets in addition to all of the exotics. Customers are also permitted to key and box their bets at will. DRF Bets provides live racing video and video replays as well for all customers. Once you’re signed in, you can visit any track to place bets and most will have a live video feed available. So, even if you don’t have access to racing channels on TV where you live, you can still watch the action online. Live video is available on all mobile devices in addition to the main website. The DRF Bets interface is exactly the same as the interface at XpressBet, so I won’t go into too much detail over again here as well. You can see a few screenshots over in our XpressBet review for a refresher. The only difference you’ll notice is that instead of the XpressBet logo, your betting interface here will be adorned with DRF Bets signage. Like XpressBet, DRF provides three different wagering pads that offer varying compromises between simplicity and flexibility. The basic “Classic” wager pad is the most intuitive for recreational bettors while the “Pro” and “Wagerpage” pads offer handicappers more options for construction exotics and viewing information. Personally, I found all three wagering pads fairly intuitive. The only issue you’ll find is actually figuring out how to switch between the three wager pads when you first log in. DRF Bets throws a lot of information at you on the main home screen and it takes a little while to figure out how to customize everything to your liking. The best thing you can do is just jump and start exploring the interface. Getting everything perfectly customized will take some time, but you won’t have any trouble placing your first bets because the main layout on the home screen shows a list of tracks. Selecting any track from the list (which shows upcoming races first) will take you to a simple betting screen allowing you to place any type of bet. 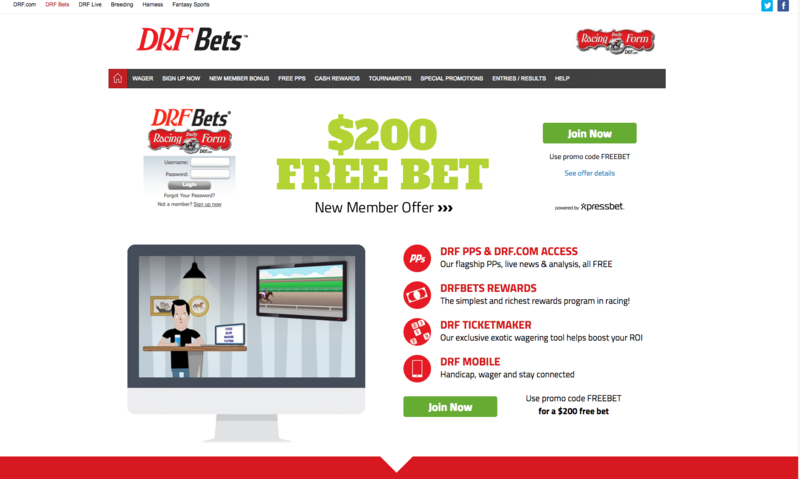 DRF Bets offers a new customer bonus, access to free past performances and a cashback loyalty rewards program that all come together to make this one of the better sites in terms of promotions. 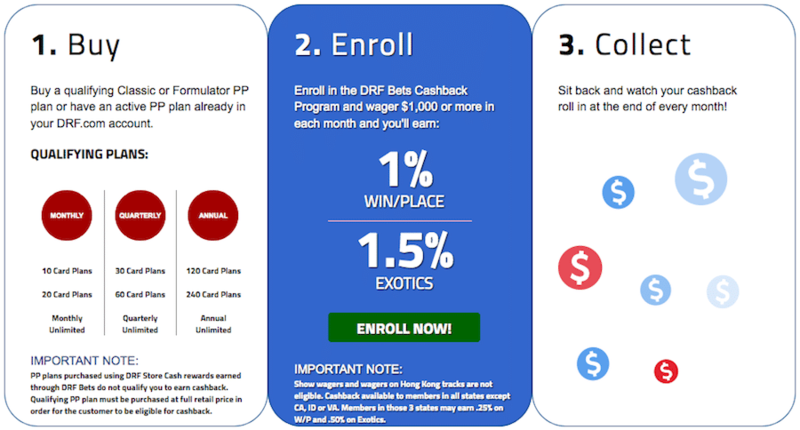 The first thing you’ll encounter upon visiting DRFBets.com is the new customer bonus, so let’s begin there. If you sign up for an account and use the promo code FREEBET, DRF will drop $50 in your account within 2 business days. This is a free bet which means it cannot be withdrawn, but it comes with no other strings attached except it must be used within 30 days. You do not need to make a deposit to claim this bet. After you get your first free bet, you can get up to $150 in additional free bets if you meet the following requirements. Second $50 Free Bet: Wager $50 within your first seven days of signing up. The most important thing to know about these deposit bonuses is you must claim them in order. After you sign up for an account, you’ll get the first $50 free bet immediately, but you will need to also wager an additional $50 within your first week to claim the second free bet. Then, you will have another seven days beyond that to wager another $50 for the third bet. The fourth free bet is likewise earned by wagering another $50 in your third week as a customer. If you skip any of these, you will not be able to claim the next one. If you skip the second free bet, for example, you will not be able to claim the third and fourth. DRF Bets has a comprehensive past performances program that refunds all costs associated with PPs as long as you have money on a race. Bes as small as $2 will get you basic PPs while bets of $25 or more will give you premium PPs that would normally cost you $3.50 a card elsewhere. DRF Classic PP: 12 running lines, 6-12 workouts and Beyer Speed Figures. Normally $3.50. Free with a $25 wager. Daily Racing Program: Up to 10 running lines, speed & pace figures, class/power/speed ratings and last 4 workouts. Normally $1.50. Free with a $2 wager. TimeformUS PP: Lifetime running lines & workout history, pace projector, pace-adjusted speed figures and optimized for tablets/web. Normally $3. Free with a $5 wager. Equibase Basic PP: PP data similar to printed program, Equibase class ratings, Equibase speed & pace figures, results charts and first-time gelding info. Normally $1.95. Free with a $2 wager. You can get your programs by purchasing them from inside your wagering account and then placing a qualifying bet on that race. DRF Bets will then credit you with a refund within 24 hours of the race. After a major overhaul, the new DRF Bets cashback rewards program offers customers DRF store credit and up to 5% cashback on wagering activity. The program opens at level one with all customers qualifying for PP refunds when bets are placed on races (as described above). Once you breach $1,000 in wagers placed in any single month, the rewards increase significantly to offer anywhere from $20 to $100 in DRF store credit. Once you reach the $1,000 threshold, you will also receive 1.5-5% cashback if you also have an active PP plan in place. The store credits listed above are automatically awarded as soon as you reach the minimum wagering amounts for that month. If you also have one of the following PP plans in place, you’ll also get the cashback bonus. The following image shows how that portion of the program works, but keep in mind that your cashback rate jumps to as high as 5% if you bet at least $8,000 in a month. Customer support at DRF is on-par with the support I received at XpressBet – which is a good thing. If you’ve seen our XpressBet review, you’ll know that I spoke very highly of their support. I’m happy to report a similar experience with DRF. The reason I had to contact customer support in the first place was to transfer my XpressBet account over to DRF Bets. It just seemed to make sense that I have an account here to write a proper review. I actually ended up calling DRF.com on accident rather than DRF Bets itself and ended up speaking to two different people. Both were pleasant, helpful, competent and were native English speakers. If you have any questions or problems, I am confident DRF Bets will give you the support you need. My phone call was answered in under one minute and I had my answer roughly five minutes after that. Head-to-Head: DRF Bets or XpressBet? You can only have one account at a time between DRF Bets and XpressBet, so you’ll need to choose one or the other. My experience with both sites is that they have more in common than not. They have identical wagering interfaces, identical numbers of tracks on offer, identical live video options and identical deposit and withdrawal methods. One minor between the two is that DRF Bets can give you free access to a variety of past performances and racing programs due to its association with DRF.com. If you’re a serious handicapper and want access to the most detailed PPs, DRF Bet is probably the better option. On the other hand, XpressBet has the bigger welcome bonus (up to $500). The bonus at DRF Bets maxes out at $200. This matters if you’re still in the early bankroll-building stages. Just keep in mind that the smaller bonus is easier to clear, so it may make sense to claim the smaller DRF bonus first depending on how much money you have to deposit and wager. Being owned and operated by the Daily Racing Form gives DRFBets.com a leg-up over other betting sites in terms of analysis, news and access to premium past performances. One of the major benefits customers of DRF Bets receive is free access to past performances from DRF, TimeformUS and Equibase. These tools would typically come only at a fee at other betting sites, but can be had for free at DRF Bets whenever you have money on races. Ultimately, you won’t go wrong with either racebook. Both are highly reputable, financially stable and are licensed in the United States. My experiences at both sites have been overwhelmingly positive. Additionally, DRFBets.com is unable to accept customers who live within 35 miles of Harrah’s Chester Downs, Philadelphia Park, Penn National, Pocono Downs and Presque Isle.